When it comes to going away this time of year, especially in Europe. It’s a difficult decision as to what to pack and wear? Will it be sunny and warm or cold and rainy. You maybe ok if you are going outside Europe but always pack a blazer or cardigan just in case. 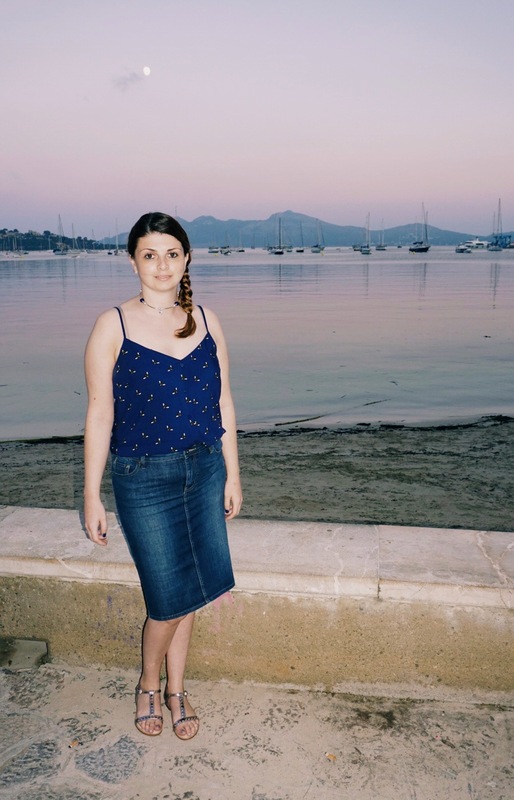 I have recently been to Mallorca and this is my look book as to what I took and wore for the week I was there. I was about 25 degrees and mainly wet but the occasional ray of sunshine. So here are my 7 outfits. 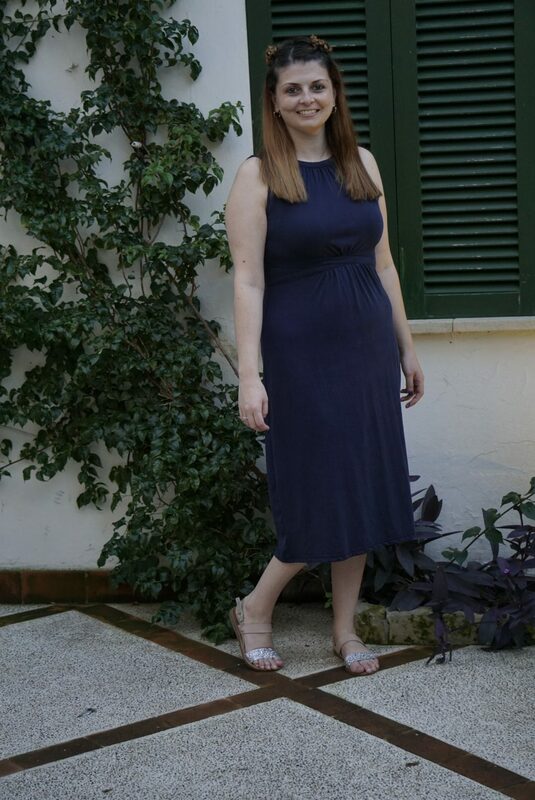 So for the first night I went for this simple plain navy blue midi dress. I love this dress because it fits well, suits me I think anyway and can be dressed up or down depending on the occasion. I also had the my black blazer with me to wear every night if needed. I pair this with my comfy flat sandals. I love adding the pink and sparkle to the plain outfit. It just adds something to the outfit. 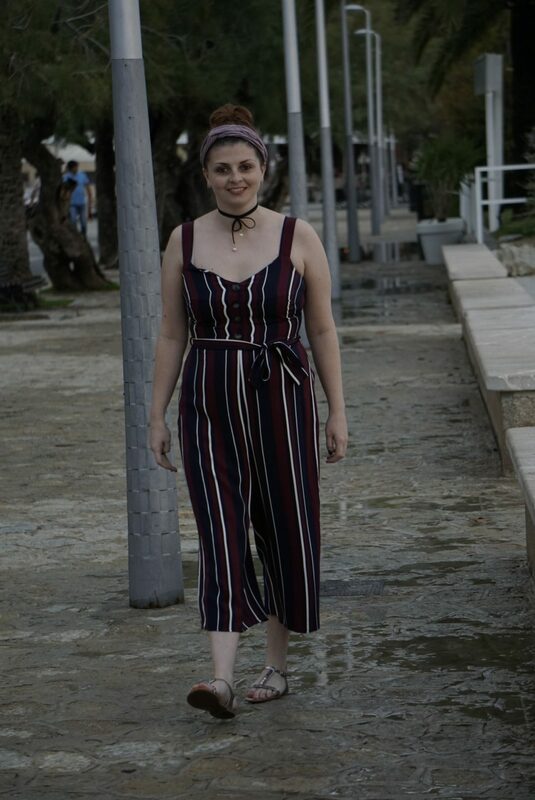 On my second night I am wearing my striped jumpsuit. I love how the colours make it have the Autumn feel yet it’s a summer jumpsuit. It’s perfect for the evenings because its midi length your legs or mine I this case are more or less covered which helps with the colder weather and the mosquitos. I have paired this jumpsuit with my rose gold sandals. These are really comfy as well because of the padding on the sole. If it was colder you could add a navy blue or white t-shirt underneath and I think this would help you get more use out of the jumpsuit. I am wearing my hair up and matched the burgundy in the jumpsuit to my headband. For night three I am wearing my patterned oriental trousers. 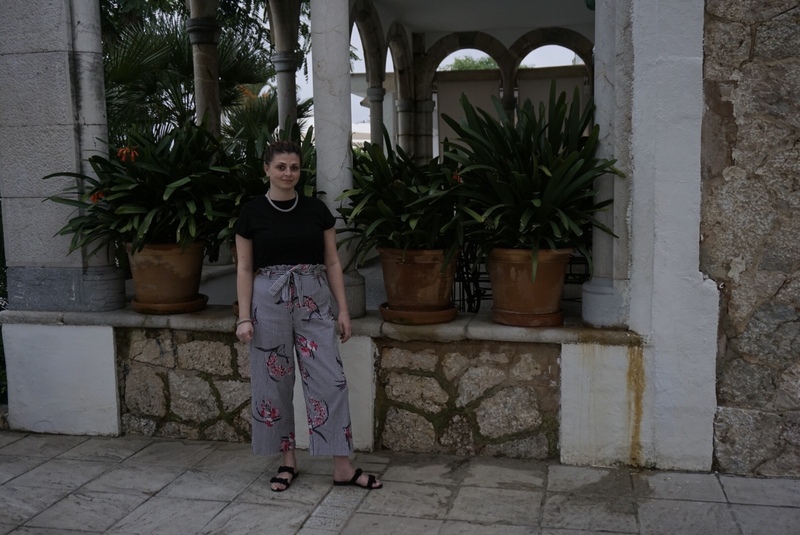 I love patterned trousers these are so good to dress up a basic tee. I am also wearing my matching jewellery that also helps to dress up the t-shirt. It had rained a lot this day so it was definitely good to have that colder outfit to wear. The trousers are thicker as well so perfect for Autumn, Winter and Spring. I am also wearing my black suede bow sandals. For the forth night I am wearing my polka dot navy blue and white midi dress. 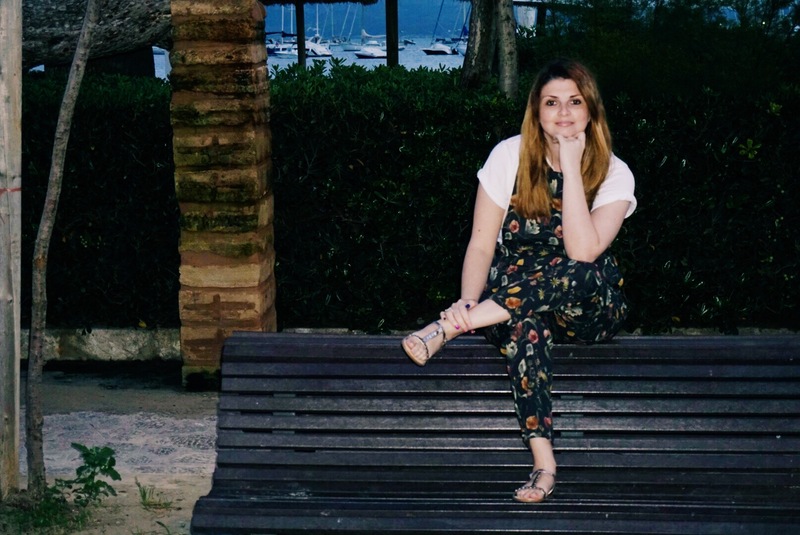 Which is summery but its but like the jumpsuit you can wear a t-shirt underneath to make it a little warmer. Again I have my pink and silver sparkly sandals on just to add a little extra colour to my outfit. I love these and could wear these all day every day. For night five I am wearing my very own handmade dungarees. I love a pair of dungarees and I wanted something more out there for Autumn. I wanted a fabric that was cool enough to wear away but also wear with jumpers and brogues for work and out with friends. In this I have paired them with a basic white tee just to add some brightness to the outfit. I am also wearing my rose gold sandals. This outfit again is good for the rainy days and the cooler days having your legs covered. For night six I decided to wear my knee length denim skirt with my navy bumble bee cami. I am also wearing my very own jewellery to tie in the bee theme. With the skirt being that little bit longer really helps with the breeze. Again if colder I added my blazer which went with every outfit. I have my rose gold sandals on for this outfit as well. For the seventh night I am wearing my pastel stripe dress which is really casual but comfy. I think this is perfect for summer really, day or night but I guess you could dress up or down. I wanted to wear this as I haven’t worn much since brought. I added my pink and silver sandals as well to tie in with the pink stripe in the dress. I love the bell sleeves on this dress which I think makes the dress a little more than your everyday dress. So these are my seven outfits. What would you take to wear for an Autumn trip away? Or what is your favourite of mine? Gorgeous looks – every single one of them! I really loved those trousers you featured. I could use a good pair like that for traveling too. They are all very cute. My favorite is the second one! 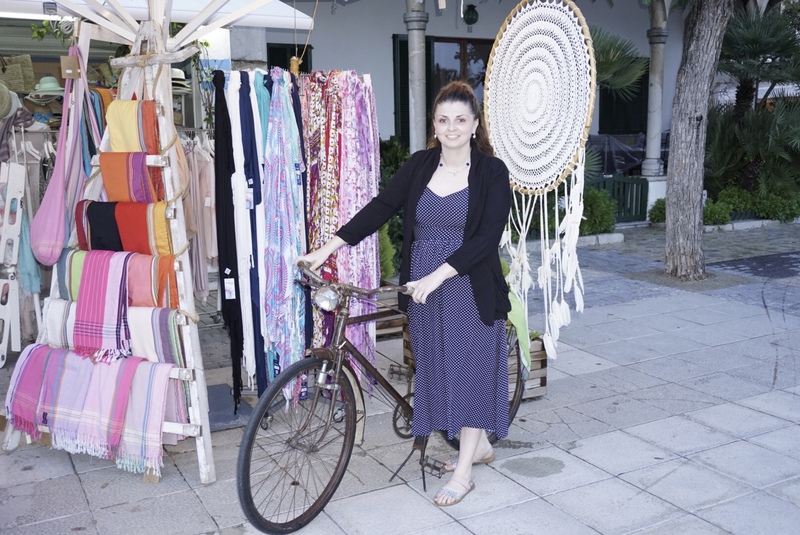 This looks like a beautiful place and I am LOVING all your outfits! Rockin’ it girl! The jumpsuit with the white t-shirt is my favorite, so classic & pretty!